After my vampire facial, my face looked like a tomato and felt like it was freshly sunburned. Thankfully, the feeling is short lived - only a day if you get it in the morning like I do, but you still need to baby your skin. Missed my post? You can read all about my facial here, but here’s a quick tutorial. Micro-needling is a tool with micro sized needles that are rolled over your face, creating tiny punctures on the surface of the skin. The punctures activate the skin’s natural healing process and collagen production. It’s important to give your skin what it needs to optimize healing and collagen growth now that you have a ton of teeny wounds covering your face. The first thing applied to the face is during the actual facial - the platelet rich plasma. This natural growth hormone remains on your skin for 4-6 hours. But once the PRP is washed off, what you put on your face next is super important. 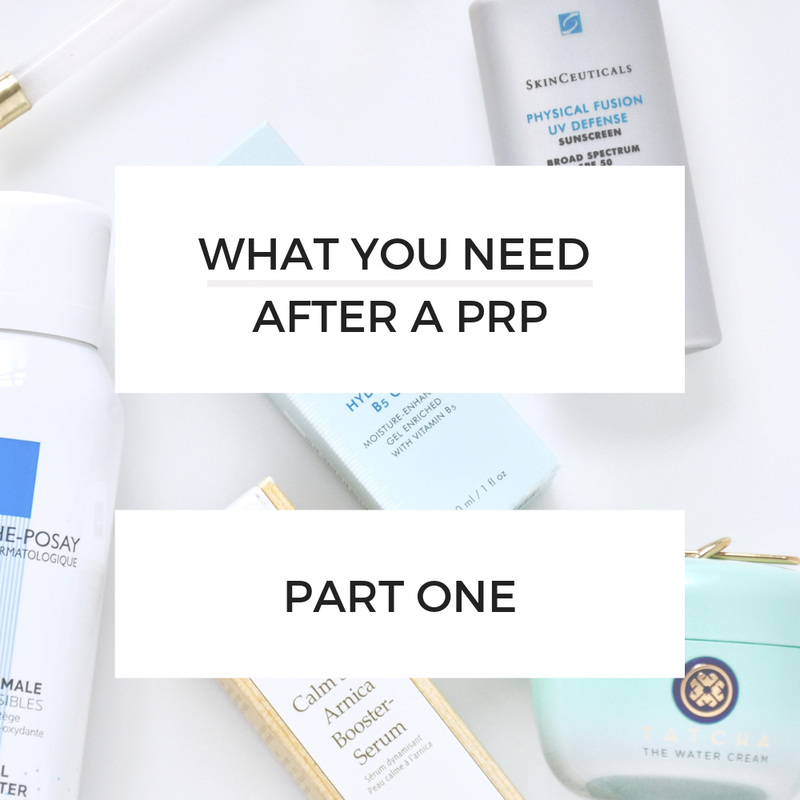 Here’s a breakdown of the beauty products you should use after a PRP facial with micro-needling. 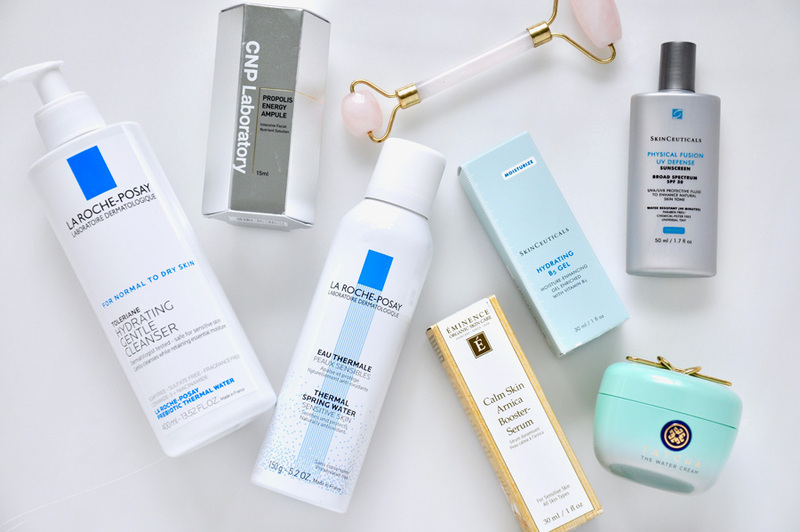 While most of these are products I continue to use following the first 3 days, a few of them are taken away with other products added to replace them. I’ll post more on that next week. Please note, I am not a doctor or aesthetician. These are just the products that I personally used and recommend after this treatment. La Roche-Posay has a Hydrating Gentle Cleanser that is perfect for this type of treatment. The milky formula gently cleanses your skin and helps maintain moisture instead of stripping it away. I use 3 serums during this process. Each one targets a different problem. Can I find one that has everything in it? You probably could, but I’m not sure how effective it would be - these serums are potent! I use a quartz roller to put the products on my skin as it is still healing and I don’t want to pull on my facial skin while applying anything. First I use Skinceuticals Hydrating B5 Gel. This gives my skin a high dose hyaluronic acid, which is basically a supped up moisturizer. Next, I use Eminence Calm Skin Arnica Booster-Serum. In a serum form, my skin readily absorbs arnica so it can quickly start doing it’s thing. Finally, I use CNP Laboratory Propolis Energy Ampule. Propulis is made from bees/honey, so before using this product, make sure you test for allergies and I would avoid it altogether if you are allergic to bees and/or honey. Propulis helps strengthen and heal the skin’s barrier, some say it has anti-bacterial properties and will also help clear congested pores. Tatcha The Water Cream is hands down my favorite lotion after this treatment. I find it soothing and extremely moisturizing. I’ve tried a few other creams since getting the facial, but I keep going back to Tatcha’s. Skinceuticals Physical Fusion UV Defense SPF 50 is a lightly tinted sunscreen that blends into skin. I also wear a hat to keep my face covered to ensure the sun doesn’t penetrate my healing skin. During the day, it’s important to drink plenty of water. Your face is going to need a ton of moisture. La Roche-Posay’s Thermal Spring Water is a fabulous tool to give your face quick touch-ups of moisture throughout the day. I pretty much pop it in my purse and use it every 30 minutes or so for the first 2 days. And there you go! These products helped my skin heal beautifully, so by Day 3 the only thing visible on my face was any bruising from the treatment. Pretty sweet if you ask me!